Home Job Tips Job Interview Tips | The Most Asked Interview Questions & Answers For Managerial Position - Describe Your Management Style? Job Interview Tips | The Most Asked Interview Questions & Answers For Managerial Position - Describe Your Management Style? 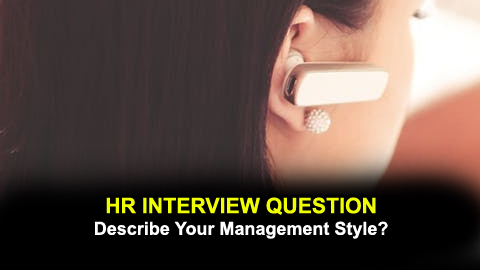 The Most Asked Interview Questions & Answers For Managerial Position - Describe Your Management Style? Generally this question is not only asked to operation manager but also for a position that requires supervising others. However, this questions sounds little bit unusual and awkward. All you need is to respond in a way that shows you can be an effective leader who’s right for the team . The interviewer will be keen to find out how you interact with staff working under you, how you work on a day-to-day basis and your perceptions of leadership. To provide the appropriate answer to this question, you also need to highlight some examples from your past. You need to remember, an effective Manager, will first take time to understand the various personalities on his team and the next step is to use the right style to ensure you tap the right potential and mentor them to have a sucessful career. So, management style will certainly differ depending on the situations. How you handle challenging situations with employees. How you handle issues with building sales and per-client revenues. How you approach concerns with cash flow and forecast cost commitments. How you coach and avoid micro-managing your staff. Answer: Management style depends upon the employee's competence and motivational stage for a task at hand. I work to inspire and motivate teamwork for achieving goals and influence valuable changes. I am always open to new ideas coming from team members. I consult with them frequently and encourage and support independent thinking. I believe in establishing an open discussion for decision-making. I recognize the skills of key team members and utilize their strengths to the benefit of the team.